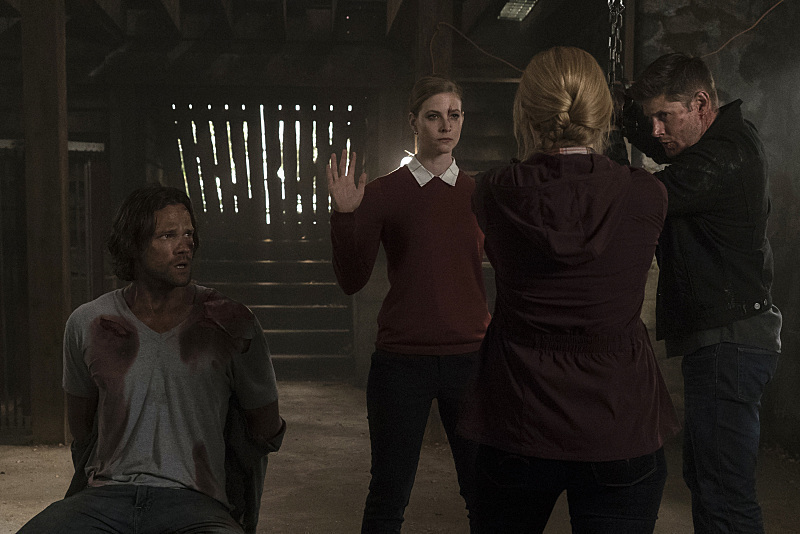 The British Men of Letters are out for some Winchester blood, so Sam, Dean and Mary better watch their backs. During Thursday’s episode, Lady Toni Bevell proved to not only be absolutely dreadful, but an even bigger threat than Lucifer. Obviously, Lucifer (who is now inhabiting the body of Vince Vicente, played by Rick Springfield) could take out both Toni and the Winchesters with one sweep of his hand, but at this point in time, Sam and Dean better worry about Toni and her London chapter. Who’s with me when I say not only is Toni terrible, but one of the most awful villains yet? That said, I will say Elizabeth Blackmore does a splendid job in making me hate her character. As teased since the Season 11 finale, the British Men of Letters don’t appreciate how Sam and Dean have been hunting and causing havoc in the United States. What are they going to do about it? If need be, they’ll just eliminate them altogether. Say what now? They’re just going to terminate Sam and Dean, aka, two of the best and most heroic hunters out there saving the world? Granted, they’ve both made major mistakes and some big messes along the way, but they are still really good at their jobs. However, to get rid of them once and for all? Yeah, that’s overkill if you ask me. Thankfully, during tonight’s episode, another member named Mick from the British Men of Letters put a stop to Toni and assured Sam and Dean that Toni would be dealt with appropriately for going too far in torturing both of them. He even extended somewhat of an olive branch by suggesting they form a partnership. Sam and Dean aren’t jumping into anything too quickly and know these particular Men of Letters are bad news. In addition to wanting to eliminate Sam and Dean, the British Men of Letters are also looking to stop the wrongdoings of American hunters and end the supernatural threat in the U.S. once and for all. Apparently, Toni was supposed to put that plan into motion by first identifying hunters and then gaining their trust. If she thinks Sam and Dean are ever going to trust her now, they most definitely won’t. Right now, Mick isn’t itching to kill Sam and Dean, but Toni sure is. I’ll bet she would get rid of them this very moment if she could, but Mick is holding the reins. Plus, it appears that if any dirty work needs to be done the still anonymous Mr. Ketch will be taking that role upon himself. He is also on his way to the States to help Toni and Mick, so now the Winchesters have him to worry about. Here I thought Sam and Dean might have a season filled with fighting the supernatural and once again trying to put Lucifer back in the cage, not worrying about a Men of Letters chapter trying to tell them how to do their jobs (and possibly killing them in the process). Who am I kidding? Sam and Dean never get a chance to relax.